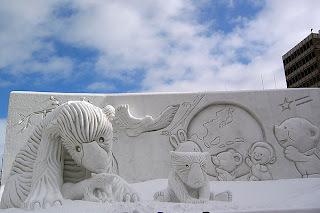 While Sapporo has several locations which have these sculptures on display, the festival is actually being celebrated in other parts of Hokkaido as well. Cities like Asahikawa and even onsen resorts like Sounkyo also have their versions of the sculpture display. Just goto any tourist information counter and you should be able to find out all the various celebrations around Hokkaido. And when night falls, and the lights go up, it's really pretty everywhere! 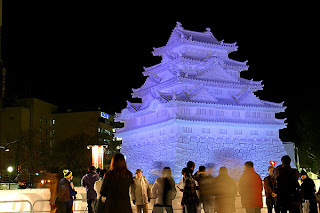 Besides the Snow and Ice Festival, there is another beautiful and romantic festival, held only in Otaru. 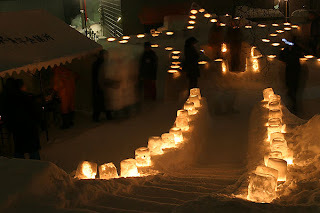 The Otaru Yuki-akari-no-michi (Snow Light Path) Festival. 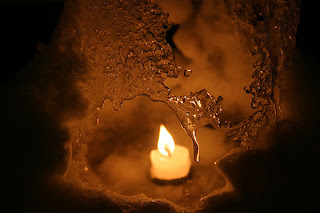 Here, candles will be lighted in ice casings/chalices and placed along the streets as well as the famous Otaru Canal. Mini lighted "boats" (not sure if they're paper) will also be placed in the canal. At night, it is really really pretty! So remember to bring your tripods! Protect yourself adeqately, and you'll really enjoy the place and enjoy your photography! looking at your photos,how i wish i didn't miss the sapporo festival by 2 days. enjoyed the bus ride from akan to abashiri the most.hokkaido is most beautiful in its whiteness and wilderness. the only photo i really like,happened to be in otaru. Hokkaido is also such an interesting place to be in and I sure envy you for being there. 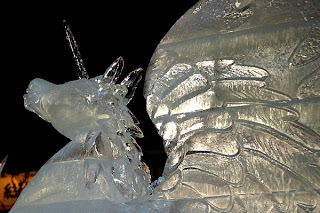 Great ice sculpture you have as well.